Well, the techno-thriller Transcendence may not have worked out all that well for Johnny Depp last month, but fans of the actor needn't worry, because 2015 will put Depp back on the weird side again. Mortdecai is an adaptation Kyril Bonfiglioli's The Great Mortdecai Moustache Mystery, the author's final novel which remained unfinished until satirist and parodist Craig Brown completed it. In the film, Depp plays the title character, an art dealer setting off from adventure to misadventure via Jersey and Moscow to a final showdown in a Buckinghamshire bungalow of unparalleled hideousness. Sounds pretty wild. 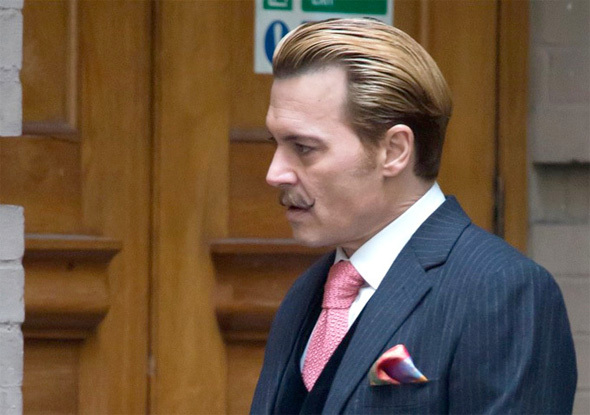 And now we have a first look at a blonde, mustachioed Depp in the film, looking like a dashing hipster. Look! Wow! That is impressive. Looks a lot like David Bowie.